DDTank will carry out a maintenance for at least 4 hours from 00:00 , July. 26, 2017(PST) for all servers. 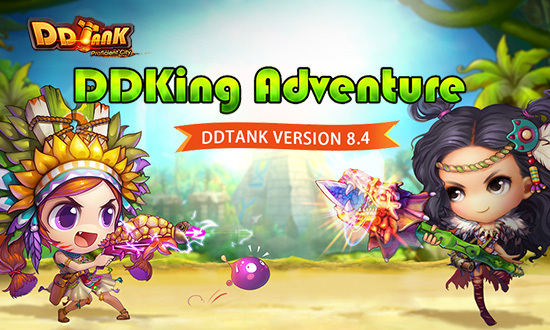 A new version DDTank3 will be released after the maintenance. The duration of version update may be delay or advanced depending on actual situation. During the update, DDTankers will not able to log in the game. Please pay attention to the latest news or notification we publish on the official website. Amulets grant you Health and all the PVP Stats (Speed, Crit, Resilience, Protection, Blast, Anti-Blast, Pierce and DMG Reduction). You can upgrade each amulet with 4 stats to obtain better stats and boost your Power. The Explorer’s Handbook can enhance your strength and help you obtain other items. It can be activated if you collect the required Shards. The Explorer’s Handbook has 4 Stages: Novice’s Handbook, Traveler’s Handbook, Master’s Handbook and Adventurer’s Handbook. Higher Stages have higher Stats. Good News! You can spend Evolution Stones or Aid Items to evolve Aid Items on New DDTank! Higher Levels have higher Stats. DDKing is the highest honor in the game. And we are here to help you achieve it! We have planned tasks and goals of Stage 30 to 70. If you complete the goals on each stage you'll get tons of rewards that will help you become the DDKing! There's also more than 12 Weapons waiting for you!